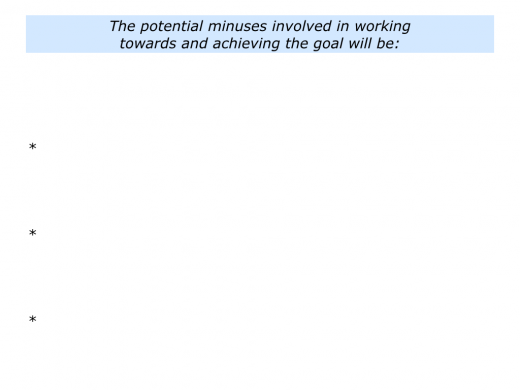 You may have attended workshops where people concluded by making action plans. They may also have rated the probability of them carrying out the required actions. The ratings need to be at least 9/10 for there to be a reasonable chance of success. Looking back on your life, can you think of a time when you took this step? Here are some answers that people gave to this question. When working to get my degree. Suddenly there was a danger I would leave university without anything. So I buckled down, cut out the partying and did well in the exams. 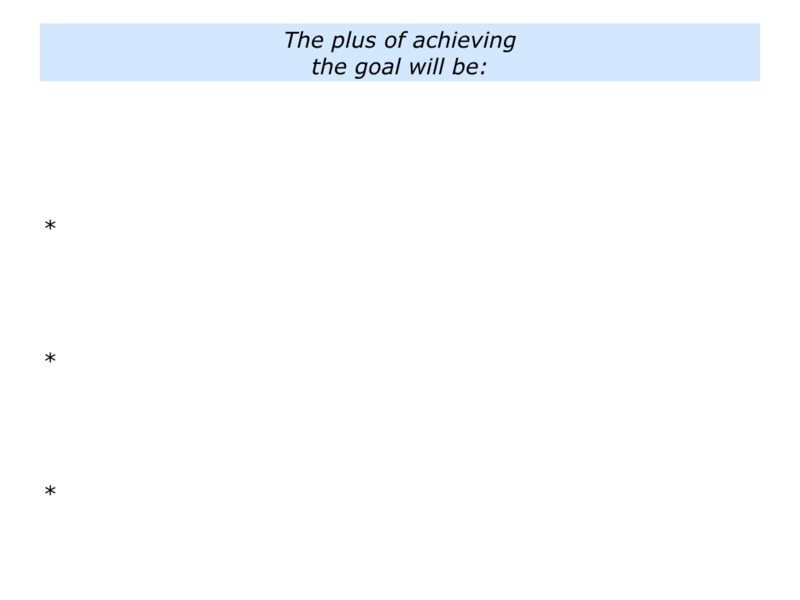 When my first internet business went through boom and then bust. Instead of taking the easy route, I decided to pay everybody to whom we owed money. It took three years to pay the debts, but afterwards I felt better. When managing the practical things after my parents died. The family situation was complicated, with the siblings having difficulties. So I took responsibility for dealing with the legal issues, selling the house and doing things fairly. It was a hard road but, with good legal help, we got there in the end. 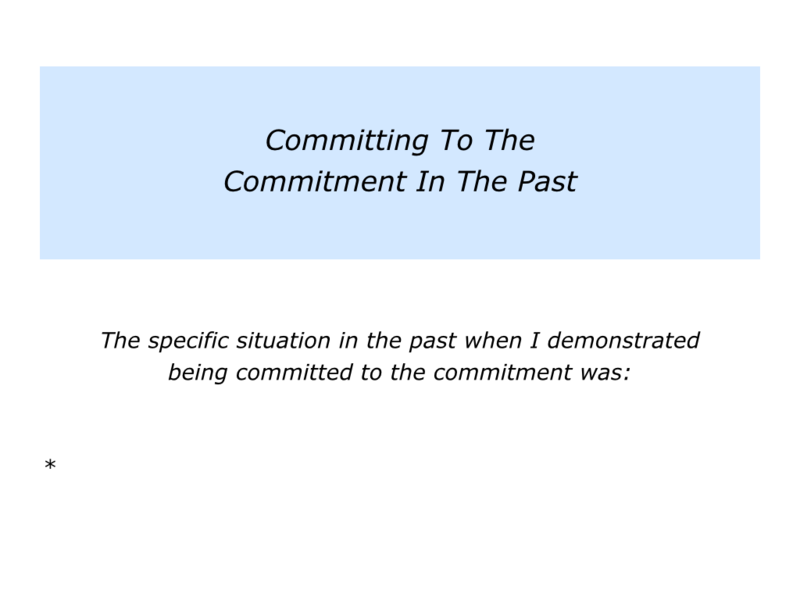 Describe a specific time when you demonstrated being committed to a commitment. 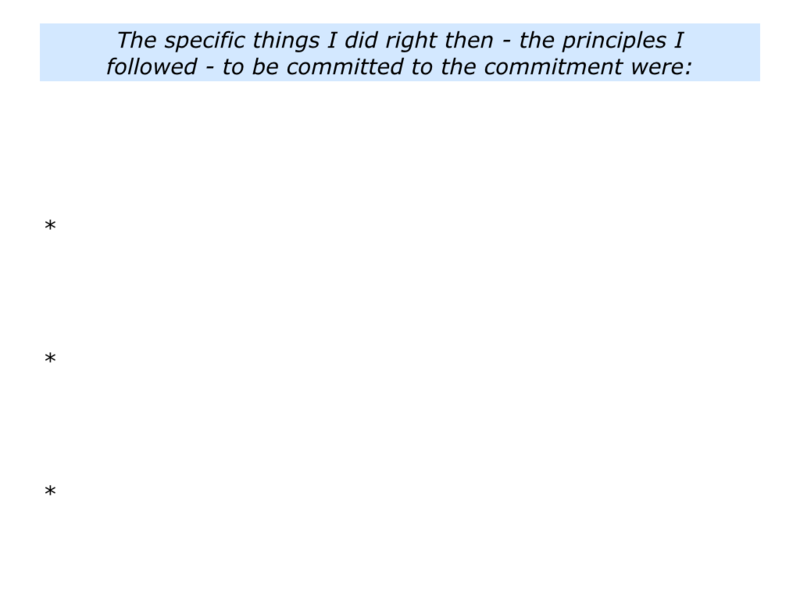 Describe the specific things you did right then – the principles you followed – to show that commitment. Different people choose different routes to take this step. Kiran Bir Sethi explains one approach in the following video. Kiran founded the remarkable Riverside School in Ahmedabad, India. She and her colleagues educate children to take charge of their lives. You can discover more about the school at their web site. In the video above Kiran explains how the school enables children to realise the following things. 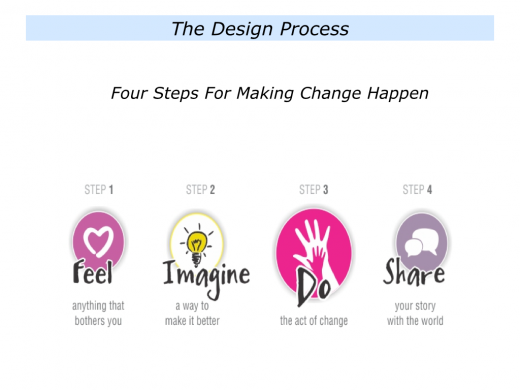 They can do this by following the design process of Feel, Imagine, Do and Share. They can find something that bothers them and choose to do something about it. They can be persistent and make change happen. They can then share their learning with the world. 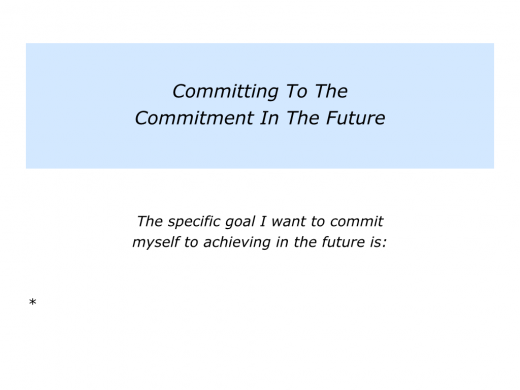 Describe a specific goal you want to achieve in the future. 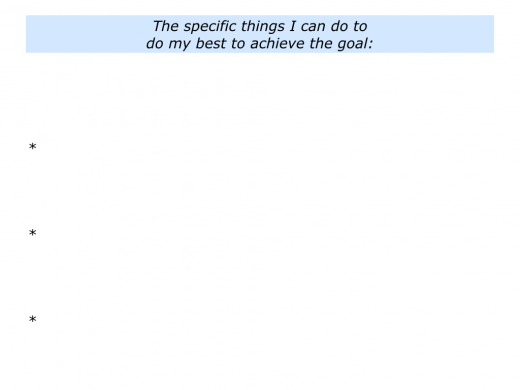 Describe the specific things you can do to do your best to achieve the goal. Students at Riverside describe a key challenge involved when going through the stages of Feel, Imagine, Do and Share. Here is a paraphrase of what they say. The first two stages are relatively easy. There are many things we feel we want to do something about. It is also fun to research good practice around the world and imagine the dream. 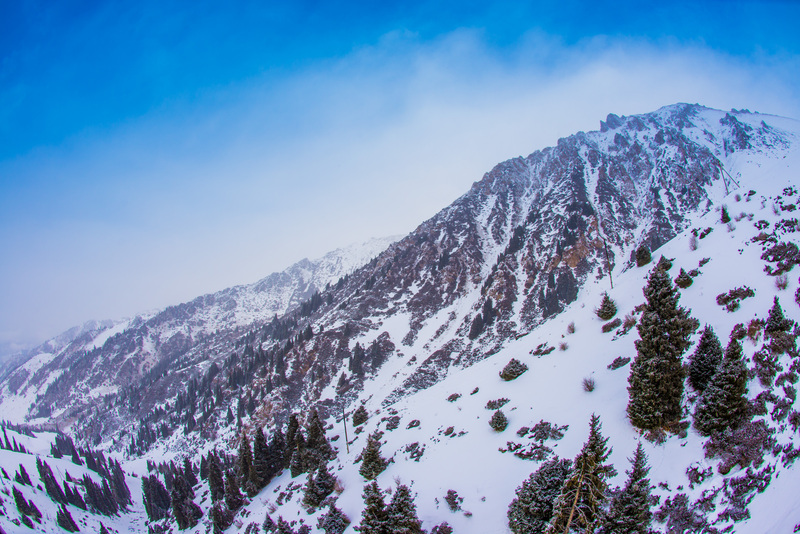 But then comes the hard part – developing the persistence required to do the work. Our generation enjoys being stimulated. If we get bored, we go onto our mobiles or click to the next web page. We learned that sweat is required if you are going to reach a goal. 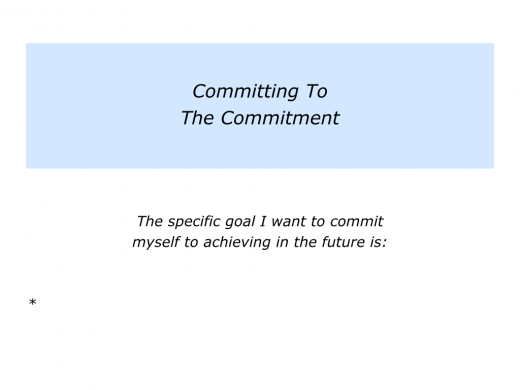 Peak performers go in with their eyes open when committing to achieving a goal. They often do this by taking the following steps. They clarify the specific goal they feel they want to achieve. They clarify how they can build on the pluses and minimise the minuses. 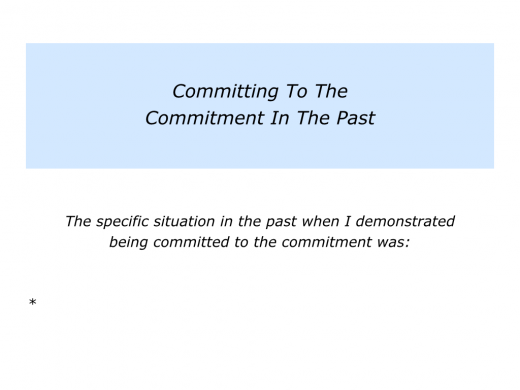 They clarify whether they are prepared to do the work required and how they will demonstrate commitment to the commitment. A person can explore as much theory as they want, but real commitment comes from within the gut. This provides the power to keep doing the right things each day on the way to achieving the goal. If you wish, try tackling the exercise on this theme. This invites you to go through the steps mentioned above. 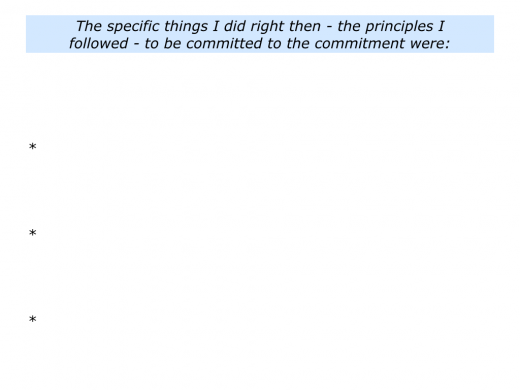 It also invites you to clarify what is required to be fully committed to the commitment.